Are you considering printing Postcards for your business? Follow these steps to create postcards that have real impact. 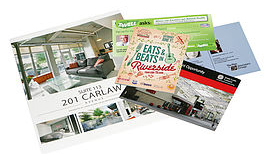 MLB Prints thousands of postcards every month for clients ranging from restaurants, to real estate agents, charities and other small businesses. Now more than ever, full colour postcards have become an economical way to promote events, your cause or your business. After printing all those postcards we thought we’d give you some pointers to help you design a great postcard for your business. When designing your postcards you should have a clear understanding of the purpose they will serve. Postcards have a limited amount of space, so it is sometimes easy to end up creating a postcard that has lots of information but that doesn’t communicate any of it well. Deciding on a specific target audience for your postcard will really help you to craft a specific message to them. When the message is more specific it’s more likely to be effective and when you know who your audience is you can be more clear about the specific benefits or advantages that your product or service offers them. If you are promoting an event, then understanding who is likely to attend that event will help you to use language and visual images that are most likely to appeal to that audience. Postcards are a great way to promote special offers, sales, or seasonal products but value doesn’t always have to mean a discount or promotion. Sometimes the value you that you present is your expertise in a particular field or the fact that you cater to a specific audience. Examples of a postcard headline that might fit into this category would be “Women only Karate” or “The Entrepreneurs Accountant”. This ties into knowing who your audience is, but it also allows you to expand your value to proposition providing details of why you are the best at what you do and who your ideal client is. This is ultimately the goal of printing postcards and it could be to generate more visitors to your restaurant or to bring more visitors to an open house or to encourage donations to your charity. Whatever your goal is, you should be clear about it before you set out to design your postcard. This is the part of the postcard that tells the recipient how to take the next step. In some cases it could be informational such as “bring this postcard to our store to receive an extra 5% off your sale” or it could be an action like “call before 5 on Friday to book a free assessment”. In any case your call to action should ideally be time sensitive and specific. This comes back to providing specific value but your postcard should help your target audience solve a problem and if it does, then it is more likely to be useful. General information is not usually particularly useful, so rather than printing a glossy postcard that describes all the services your home renovations company can do, consider showing before and after pictures that might help your target audience visualize similar renovations to their home. Less but more focussed text with one or two fonts and one or two colours will go a long way to keeping the focus on the message you want to get out to your prospective clients. Finally, consider hiring a professional to design it for you - a good graphic designer can create print ready files that both look great and print great and that will probably give you better final results than designing the postcard yourself. If you follow these tips, you’ll produce some great results and we’ll look forward to printing them for you.